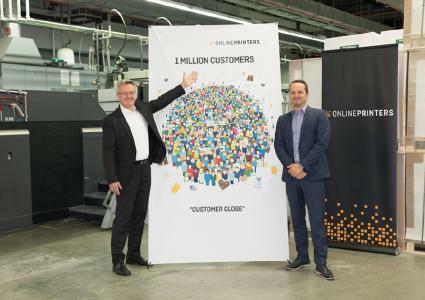 Since January 2017, Onlineprinters has acquired more than 400,000 new customers and is now proud to welcome the millionth customer. "One million customers - this number stands for an abundance of creative printing products we have implemented for our customers over the past 14 years," says Dr. Michael Fries, CEO of Onlineprinters, and unveils the art print "Customer Globe" that has been randomised with the "Mosaic" software by the technology partner HP in collaboration with the gyro advertising agency. 1,000 individual copies of it will be produced and presented to the long-standing customers. "Nowadays, there are no limits to creativity in online printing. Our art print stands for the diversity of our customers and their projects. Each of one thousand printed copies of the series is based on the same draft, yet it is one of a kind," as Dr. Michael Fries puts it. Today, Onlineprinters mainly delivers its products to business customers in more than 30 European countries. The company achieves some 30 percent of its total turnover in Germany operating as diedruckerei.de. Between 2012 and 2014, the turnover abroad becomes increasingly more significant for the online print shop. This can be explained by continued international growth efforts that started back in 2008. With the acquisition of the UK market leader Solopress, and with LaserTryk - the market leader in Scandinavia - joining the Onlineprinters group, Onlineprinters now ranks among the top 3 online print shops in Europe. 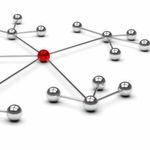 The CEO considers this international focus to be the driving force behind Onlineprinters' success. People from 40 nations work together to make Onlineprinters a success: "Wherever many nationalities come together, it only works with tolerance and respect. This is what our corporate culture is about," emphasises Dr. Michael Fries. 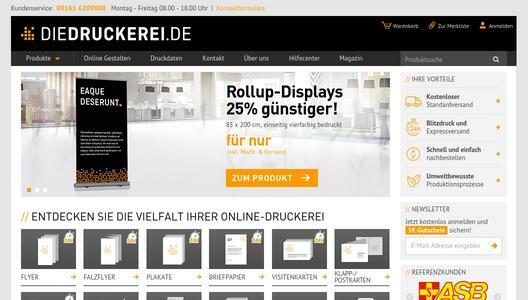 The Onlineprinters Group, which operates under the brand name of diedruckerei.de in Germany, is one of the leading online print shops in Europe. Employing a staff of more than 1,400, Onlineprinters produced 3 billion+ printed advertising products last year. More than 1,500 print products including business cards, letterheads, flyers, catalogues, brochures, large-format advertising systems and more are sold to one million customers in 30 European countries. Internationally, the provider of online print services is known under the brand name of Onlineprinters. British market leader Solopress and LaserTryk, the Scandinavian number one, are members of the Onlineprinters Group.